Dunheved China. Hand Painted in Cornwall by Derek Wilson. Derek was trained at Royal Worcester in the skill of 'Painted Fruit' on Bone China. 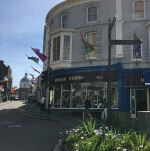 He and his partner Sheila Whitcombe (a Royal Worcester modeller) moved to Cornwall several years ago and set up their business Dunheved China. They specialised in decorating blank china items with fruit designs, birds and animals and some local scenes on plates of various Cornish places. This plate is an image of the Mousehole Harbour, looking across towards Raginnis Hill.